💡 There is another version of that kit for Arduino (see https://community.nxp.com/docs/DOC-331907), but I was not able to order that one. To use the BeagleBone and Raspberry would be something the future. There were several articles and tutorials available (see links at the end of this article), but they all did not work out-of-the box for various reasons. So I ended up doing my special tutorial. 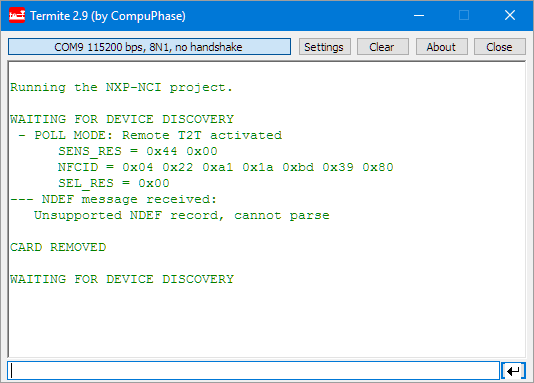 With the benefit that I learned a lot about how to use that board and I was able to fix issues in the NXP application note and demo code :-). 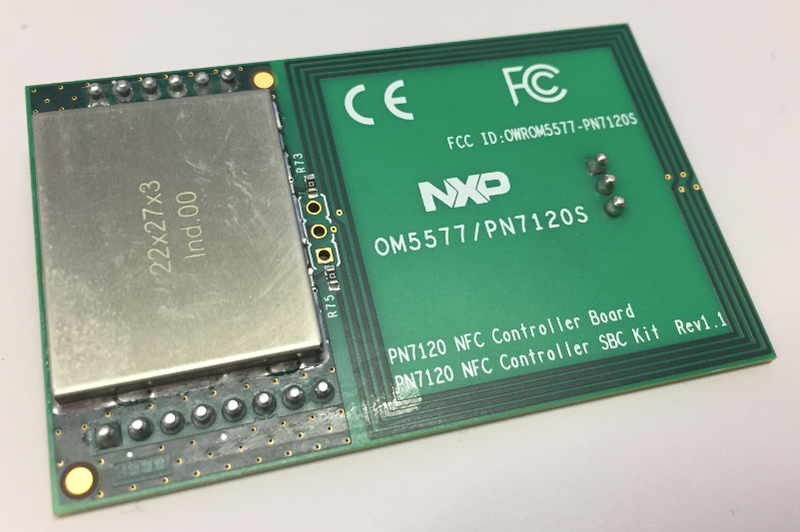 It simplifies my design as the ARM Cortex-M0 on the PN7120 does all the low level RF stuff, while I can talk to the M0 from another microcontroller over I²C. 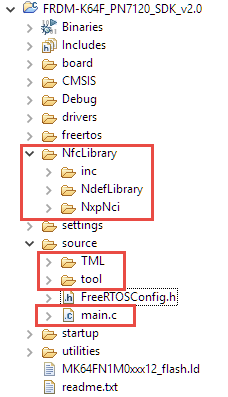 NXP delivers the library to talk to the PN7120 in full source code as ‘NfcLibrary’. This is what I’m going to use in my application. 💡 Note that I’m using an RevA/Sch-RevC FRDM-K64F board. Newer boards have SDA/SCL swapped! 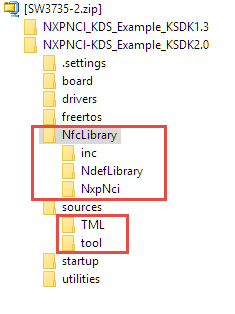 It has the NFC Library with two Kinetis SDK projects. But the projects do not compile because they are not standalone and have wrong settings. I gave up trying to fix the issues. Instead, I create a new project from scratch. 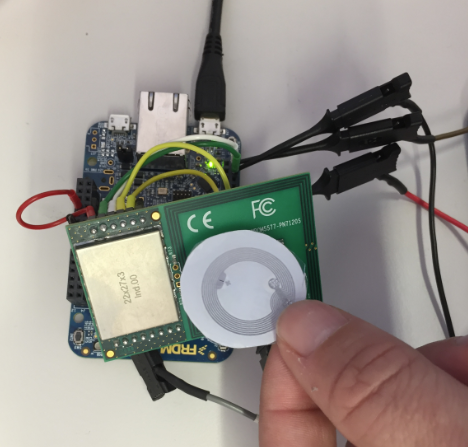 RW_SUPPORT: With this mode the host can access a remote contactless tag/card via the NFC Controller. P2P_SUPPORT: The host MCU can establish a 2-way communication accessing to or sending data to an external Reader/Writer. 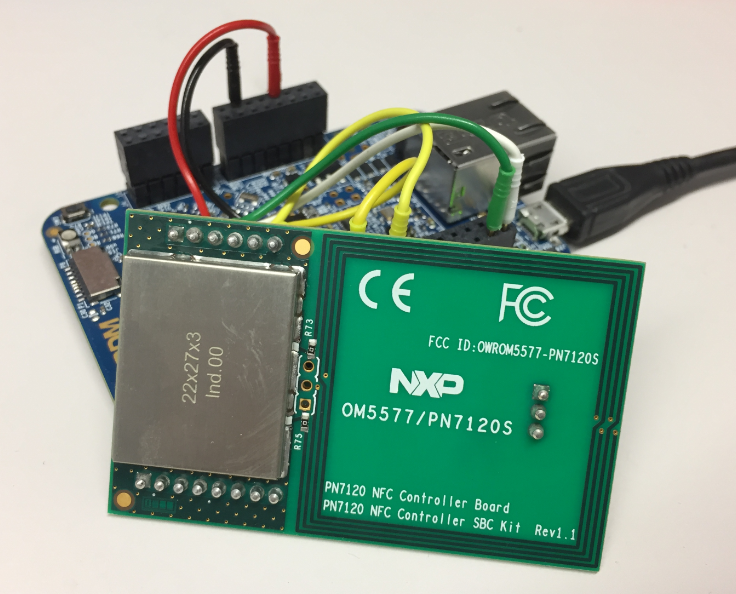 CARDEMU_SUPPORT: The NFC controller host (MCU) can emulate a contactless card which can be accessed by an external Reader/Writer. 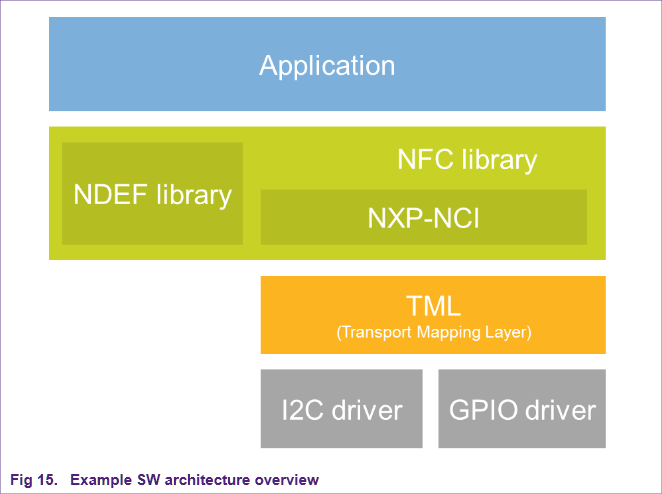 NCI-DEBUG: If defined, all information transferred between the host MCU and the NFC Controller Interface (commands, responses, notifications, data) is echoed to console for debug purposes. 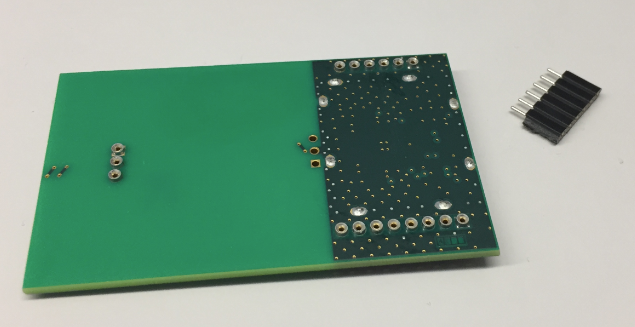 The original demo was using PTC12 which is mapped to different pins on the FRDM-K64F board, depending on the board revision. That’s why I’m using PTC4 instead. The original demo code had enabled the internal pull-up resistors for the I²C lines as a workaround, if the bus does not have pull-ups installed. The internal pull-ups are usually weak ones, so does not work in most cases any way, so be careful relying on this. As the FRDM-K64F has pullups on the board for the I2C0 lines, I don’t need that workaround. 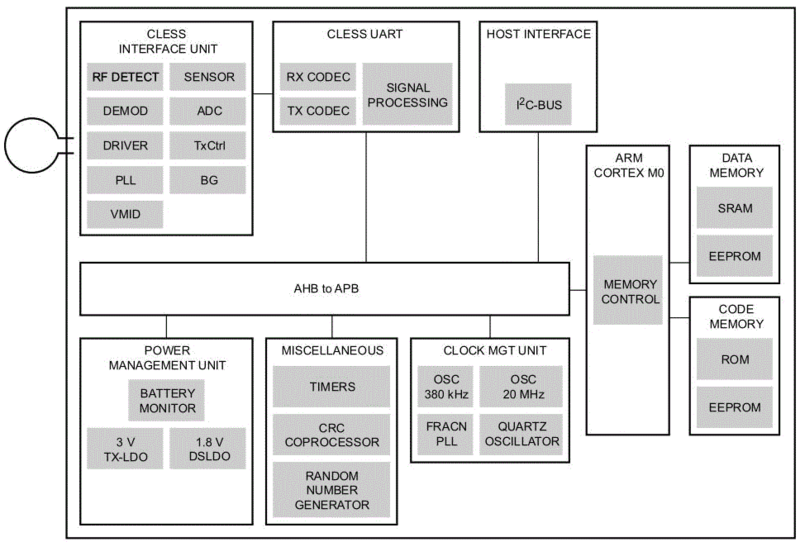 The above enables the clock gates, muxes the pins for I²C, IRQ and GPIO and configures the interrupt priority. 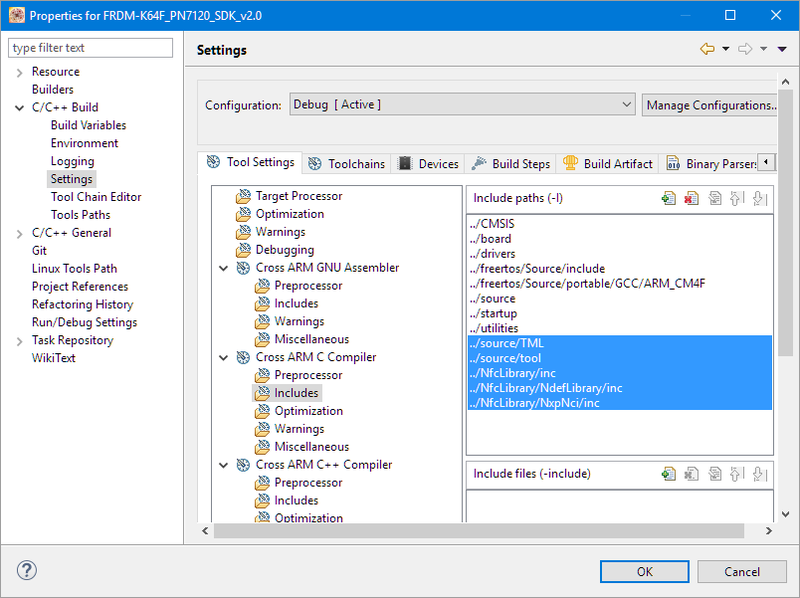 💡 Have a read of a special series starting with “ARM Cortex-M, Interrupts and FreeRTOS: Part 1” about interrupt priorities and FreeRTOS on ARM Cortex-M.
With this, have all files saved, build and debug it. 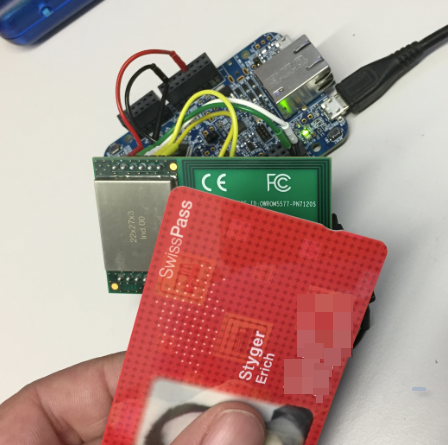 I’m able to read and write RFID cards now :-). 💡 The ability of reading/writing RFID cards depends on the security protocol. Mifare cards use a protocol which has been compromised, see https://en.wikipedia.org/wiki/MIFARE. 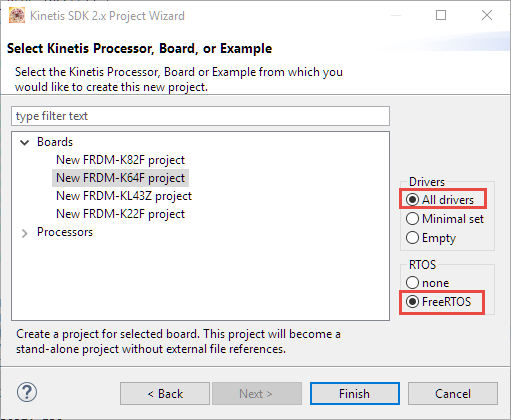 Using the Kinetis SDK with the PN7120 is possible, but many and rather complicated steps are necessary. Using Processor Expert not only makes it easier and simpler, it is portable that way too :-). 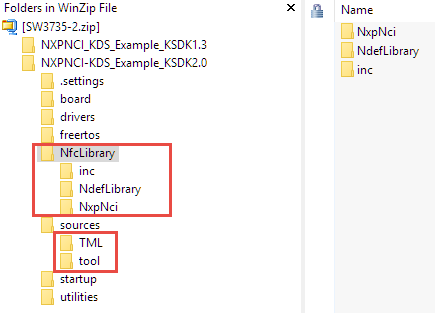 Plus not all Kinetis devices are supported by the Kinetis SDK. Because the original demo is using printf() (outsch, see “Why I don’t like printf()“), in order to keep the original demo code, I have added a wrapper to printf() (see my code on GitHub). That’s it! much easier and simpler in my view. All the code for muxing and pin configuration I was able to strip out because Processor Expert takes care of this. Using Processor Expert was not only much faster and simpler. The code and data comparison of the two projects doing the same is interesting (no compiler optimizations turned on). The RAM (bss) size needed by the Processor Expert version is much smaller, mostly because the SDK version is using an excessive amount of heap and task stack. But the code (text) for the of the SDK drivers is nearly twice as much as needed by the Processor Expert version! While the SDK V2.0 version works fine, it needs nearly the double amount of FLASH and RAM compared using Processor Expert, mostly because the SDK driver code seems to use a lot of layers and the example uses excessive amount of RAM I think mostly because of printf()? 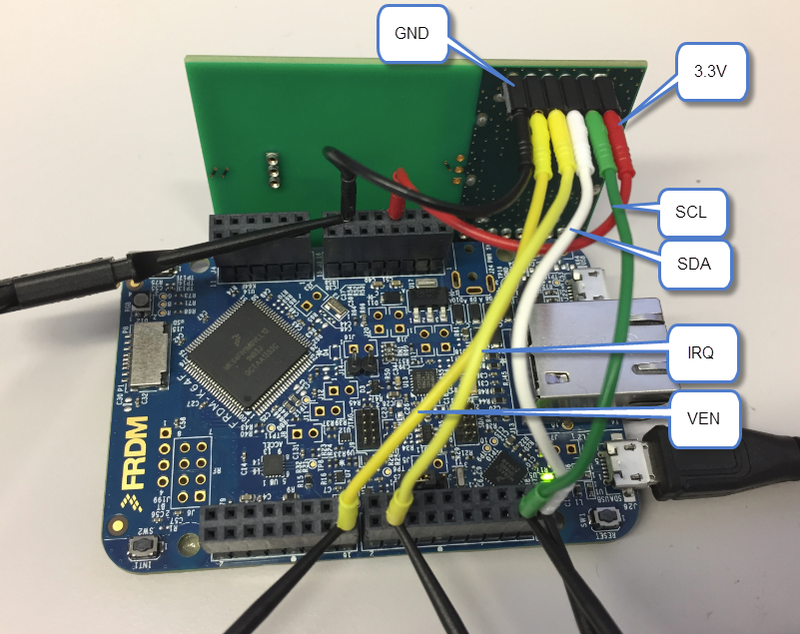 This entry was posted in ARM, Boards, Building, CPU's, Eclipse, Embedded, FRDM-K64F120M, FreeRTOS, Freescale, gcc, KDS, Kinetis, NXP, Processor Expert, SDK, Tips & Tricks, Tutorial and tagged Building, Eclipse, Embedded Component, freedom board, FreeRTOS, Freescale, gnu gcc, Mifare, NRF, NXP, Processor Expert, RFID, software project, technology, Tips&Tricks by Erich Styger. Bookmark the permalink. Erich, do you know if it is possible to buy just the PN7120 NFC controller board, without the other interface boards ? I had exactly the same thought, but did not find the board without the other interface boards. Anyone? 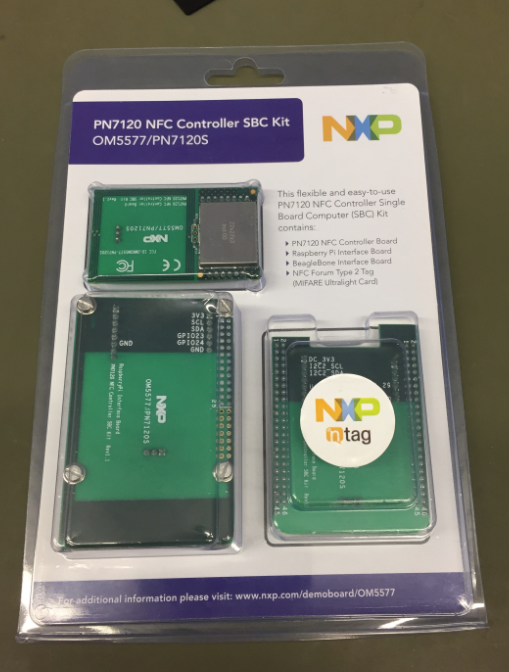 As far as I know, the PN7120 kit only exists in the form of the package shown at the beginning of this article. thanks for the confirmation from your side. To bad, because in my view this very much limits the adoption of this great device in the market, especially in the hobby market. Do you think there is any chance that this might change? Hello Erich. Thanks for the tutorial, very helpful. Any idea how do we go from this to being able to transfer files from the dev kit to an android device and vice versa. Would be helpful. I am looking at this in order to be able to extract log files or upgrade software/configuration of the K64. I am using another RFID module for lab classes, which uses the IC MFRC522. It is a quite popular module for Arduino users. I tried to port the Arduino library to a KL25 board, but I am having problems communicating with this module. Is there any chance that we have a Processor Expert component for this module soon? I do not know where the error is? It basically means that it cannot communicate with the device. Most likely your hardware connection and wires is not done correctly. Or you are missing the I2C pull-ups? Hi Erich, Thanks so much for your guide! I am currently experiencing difficulties with running the example. I am using the PEx example, which i imported, but my program seems to hang once the it calls I2C_MasterSendBlock in the generated GI2C1.c source file. The program waits for the dataTransmittedFlg value to go true, which never happens. I feel as though it is due to the interrupt not detecting sent data. Are you able to point me towards how I could go about debugging my issue? common reason for this is having the interrupts disabled. Are you using my exact example program or your own? Can you check in the Registers view with the debugger if the PRIMASK bit is set (interrupts disabled)? I have had a look and it seems the interrupts are enabled so that isn’t the issue. Maybe I was not clear regarding the interrupt: looking at the signals the I2C seems to work fine, I see the voltage get pulled to 0 then back to ~3.3V. The VEN signal seems to stay high 3.3V persistantly and my IRQ signal stays at 0V. I am wondering if the VEN signal should stay high? if that is okay I just wonder why my pn7120 is not sending the IRQ signal back. VEN should be HIGH to enable the device. It is used to reset the device (pulling it low for about 100 ms or so), otherwise it should stay high. 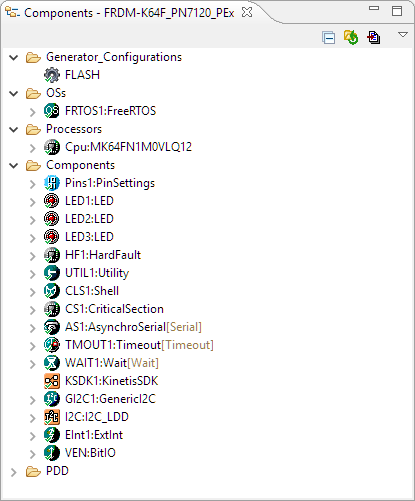 Edit: I noticed that actually the I2C pulls low and then stays low when the program gets stuck. The question would be if the microcontroller pulls the line low or the device? My conclusion is that, for whatever reason, the device doesn’t set the “dataTransmittedFlg” which is called on the PE_ISR(I2C_Interupt). 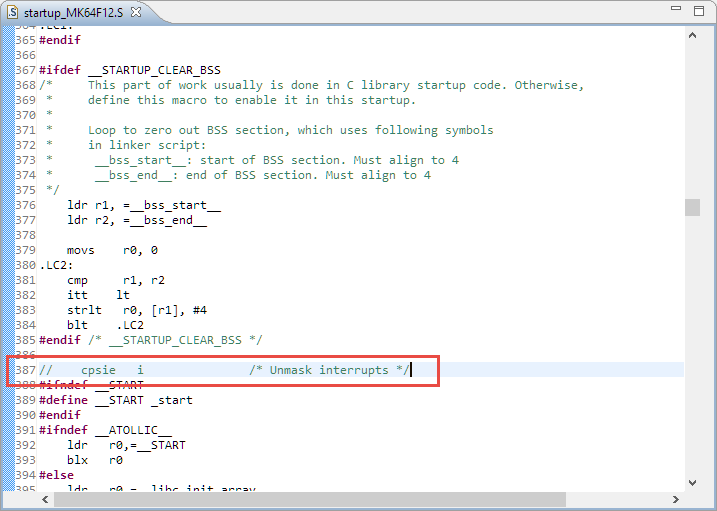 I am wondering if you could tell me how the I2C_interrupt should be configured because maybe that is my problem? This means that your interrupts do not fire somehow. 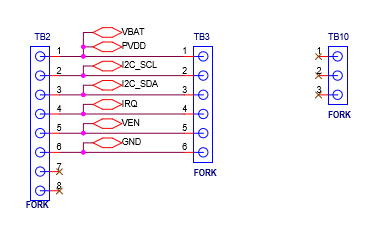 Have you checked with a logic analyzer or oscilloscope if something is sent at all on the I2C data/clock lines?